SILVER and GOLD PRICE woes this week pushed up the Dow in Metals in spite of stocks’ weakness. Dow in Silver closed the week at S$1,443.83 silver dollars (1,116.71 oz), above the moving averages but well below the top gator jaw. Dow in gold is at the upper Gator Jaw again. Closed at G$315.87 gold dollars (15.28 oz). Both are still rolling over, still doomed to plunge like Iguaçu Falls. Write it down and watch for it. Silver backed off 11.8 cents to close Comex at $15.971. The GOLD PRICE forked over another $7.10 to close at $1,167.80. Today’s gold price low at $1,162 took the price of gold into that even-sided triangle, but it closed above the upper boundary. In fact, in the aftermarket it was trading at $1,171.30. I’m no clairvoyant and my crystal ball broke a long time ago. I can only sketch out two outcomes. 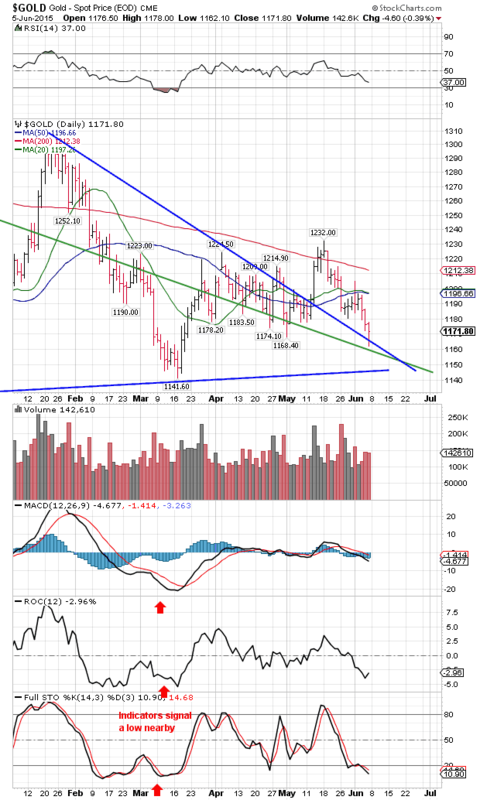 1, Gold price keeps on dropping to the triangle’s bottom boundary now about $1,145. 2, Price of gold turns around here, stumbles sideways the rest of the month, but inches higher till June ends. Chart on the right. SILVER PRICE, thy name is volatility! 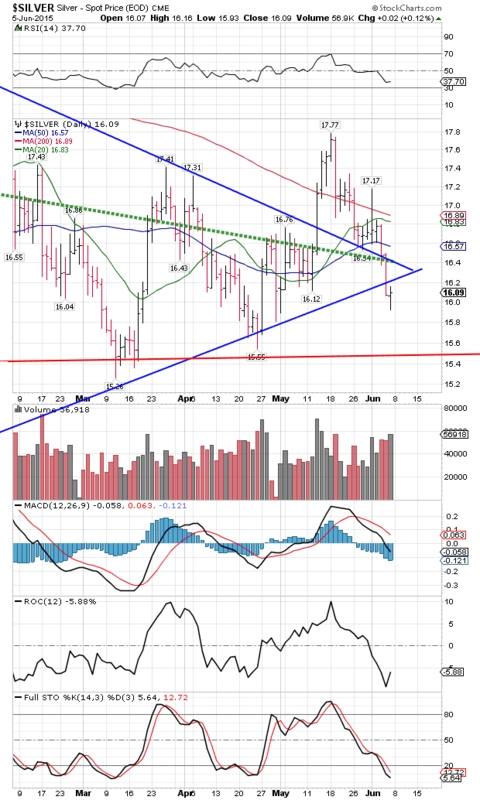 Silver dropped clean through the nose of the triangle, but on an end of day chart today posted the first half of a key reversal by breaking into new low for the move but closing higher than yesterday. A close higher than today’s EOD close ($16.09) is needed Monday to complete that key reversal. 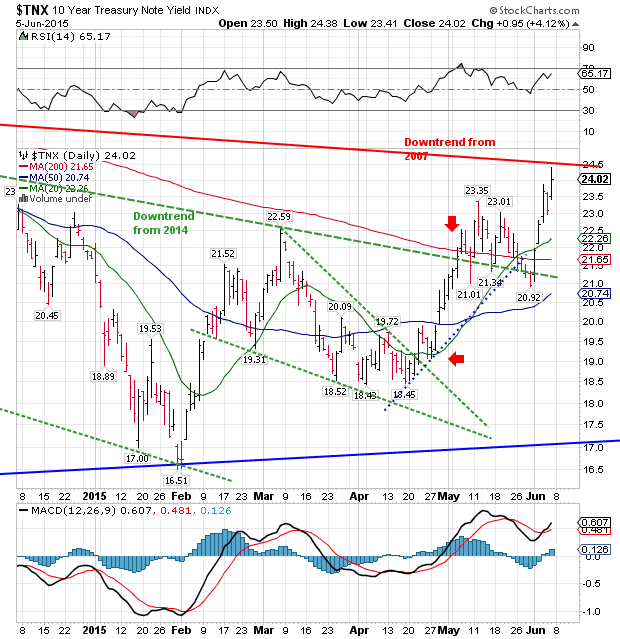 Otherwise silver may fall clean to support around $15.50. Chart on the left. What is telling, however, is how the phones are ringing. Whole lot of folks are eager buyers at these prices, all over the country. 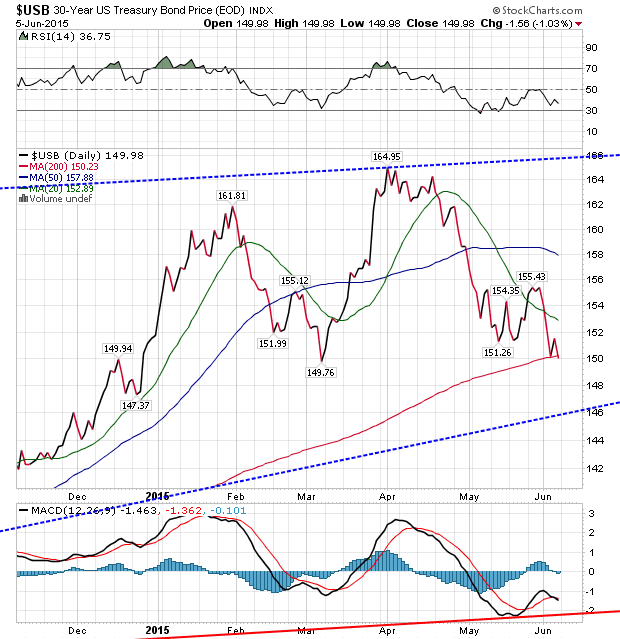 That hints that silver and gold prices won’t abide down here long. abide down here long. 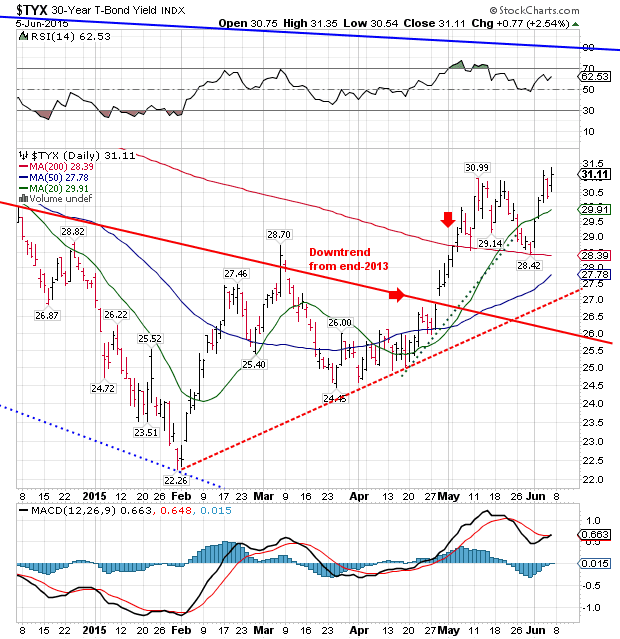 The GOLD/SILVER RATIO gave a favorable sign. It had been lingering beneath its 200 DMA (where we want it), but this week shot through that and even crossed back above the uptrend line from the April 2011 low. Today it fell back through that. And, yes, that is a big deal, a Very Big Deal, that the ratio had been trending up for four years and has now broken down through that line. Very big deal indeed. Chart on the right. Y’all ought to be buying silver and gold. Before we look at the week, let’s consider year to date performance. Since 31 December 2014 silver is up 2.6% (as of today), gold down 1.4%. Here’s how stocks have scored: Dow Industrials +0.1%; S&P500 + 1.6%; Dow Transports, -6.9%; Dow Utilities – 8.9%, Dow composite, -3.4%; Russell 2000, +4.7%; Wilshire 5000, + 2.3%. But the big eye-gogglers come with interest rates and bond prices. 10 year T-note yield, up 10.7% [sic]; 30 year bond yield, +15.4%. 10 year note price is down 0.8% and 30 year bond down 1.2%. US dollar index is up 6.3% for the year, euro is down 8.1%, and the yen is down 4.7%. This was the week silver and gold got creamed, but stocks didn’t fare too well either. US dollar index is crazy volatile, and white metals are just sick. After falling a colossal 160 basis points on Tuesday, the US dollar index lost another 51 basis points on Wednesday, but today jumped up 87 basis points (0.91%) to close at 96.36. The media attributd the dollar’s jump to a “robust” lying jobs report from the Labor Department (I added that “lying” part, and it’s the report that’s lying, not lying jobs increasing). The logic of this augury is that Mother Janet, when she’s not wishing she owned a donut shop instead of running the Fed, is watching the employment number and when it waxes “robust” enough, she will give the all clear for raising interest rates. Higher interest rates, in turn, will make the scrofulous, scabby dollar more attractive than the scrofulous, scabby yen and euro, so more folks will buy it. All this majestic, mighty aircastle was built on a little ol’ lying jobs report. The dollar’s trend is down. 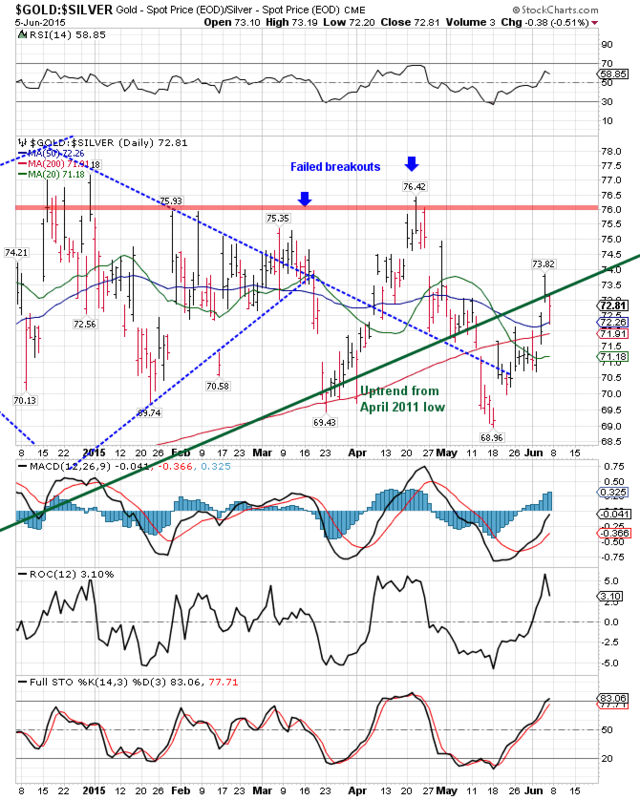 Dollar index needs to close above 97.88 to change that. If you think the dollar’s ugly, you ought to look at the euro — but put on your dark glasses first. Euro dropped 1.03% today to $1.1114. Black clouds from Greece still overhang it. Yen hit a 13 year low against the dollar today, 79.66 cents to 100 yen (US$1= Y125.53). And it’s likely to fall further. I reckon this interest rate thing’s about to get out of hand. 10 year US T-note yield rose another 4.12% today to 2.402%. It stands above its 200 day moving average and at 2.45% will cross the downtrend line from the 2007 high. Look for yourself, chart on the right. Now think about the 10 year T-note’s PRICE. It’s on the left, since June began it has been trading below its 200 day moving average and is threatening to crash through the bottom boundary of an even-sided triangle forming since 2013. The 30 year Treasury bond yield traded up through its 200 DMA as May opened, traded higher, then came back to the 200 DMA for a final kiss good-bye, and since June has shot higher. It has passed the 20 DMA and the last high. Don’t take my word, chart on the right. 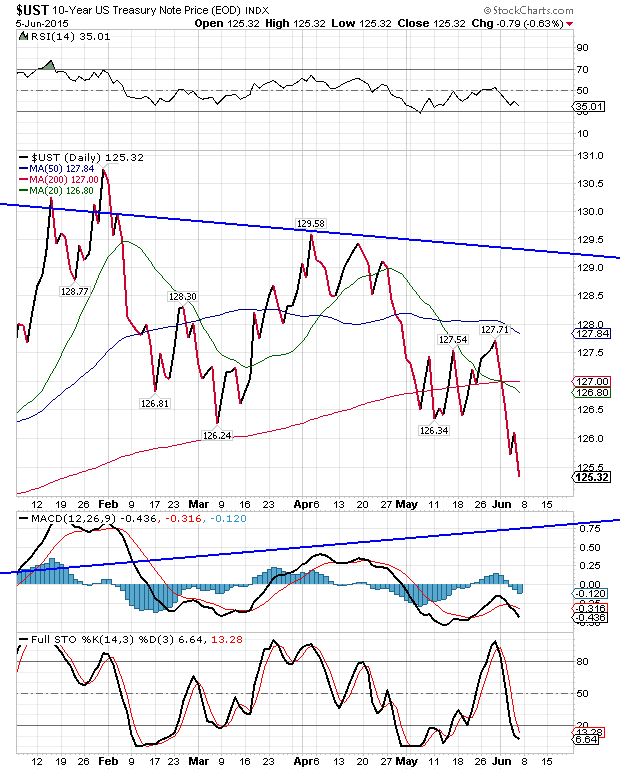 The 30 year bond price has been dropping since April and today passed beneath its 200DMA. Presently at 149.98, the uptrend line stands at 146. Chart on the left. So what? Here’s what: the central banking criminals’ strategy all hangs on keeping interest rates near zero. Rising rates means the market is testing the central banks’ fetters. Also at stake is the Cosmos’ Biggest Bond Bubble that central banks have blown up since 2008 with ZIRP. Once the stampede starts out of bonds, the ground will quake in Yellen-ville, and Mario Draghi may be looking for a job at a higher level, say, hanging from a lamppost. Stocks are struggling, heavy laden in rough seas. Today the Dow Industrials peeled off another 56.12 (0.31%) to close at 17,849.46, below 18,000 and third down week running. Also, it has pierced its 20 and 50 DMAs and today closed barely below its lower trading channel boundary. Last low was 17,738, so watch that. 200 DMA isn’t far at 17,608.50. S&P500 lost 3.01 (0.14%) to end at 2,092.83. Also in hexed alignment below its 50 DMA and barely above its uptrend line. Watch 2,068, the last low. For a person with financial staying power and patience this would be a wondrous, historic place to short stocks with long dated puts. I see where the yankee government Office of Personnel management got hacked and the hackers stole the names, addresses, and shoe sizes of four million government employees. Now the point here is not that government computers were hacked. You expect that ’cause government never quite gets it right. But my question is, why do we need four million people working for the yankee government? Just think of all the potholes they could fill and fenceposts they could set and rocks they could break up and sock drawers they could straighten if they were put to useful and productive work!